We are very proud to introduce the luxuriously comfortable Stressless Capri Office Chair by Ekornes. Ekornes is world renowned for designing furniture that is fantastically comfortable and solidly built. The Capri Office Chair is no exception and is a wonderful addition to an already extensive line of amazingly comfortable Stressless Office Chairs. The Capri Office chair elegantly sits on five wheels for greater movement and can recliner by simply pushing back. Paloma is one of the most popular leather grades to purchase the Stressless Capri Office Chair in, due to its soft and luxurious touch. To view any of the amazing Leather or Fabric types and colors that the Capri can be purchased in, simply use the pull down menu above, which is titled: "Select Leather or Fabric Type and Color". The price of the Capri will change based off of the leather or fabric type and color selected through the pull down menu. Choose PayPal Credit for their flexible payment options and familiarity when purchasing the amazing Stressless Capri Office Chair. Finance your purchase, relax with flexible simple payment options and pay the balance off over time. Remove the pressure of shopping and truly relax and unwind. Easy Payments with PayPal Credit lets you get the comfortable Stressless Furniture when you want it, and budget your payments as you go. You can choose the monthly payment amount and the length of time that works best for you. After all, who know you better than you? Pay with peace of mind. PayPal will notify you when each monthly payment is due, so all that’s left to do is sit back, relax, and enjoy your purchase. Once you have completed your order you will receive an email confirming the details. Our dedicated Customer Service Team will typically follow up with you by phone within 1 business day to confirm your order of the Stressless Capri Office Chair and provide you with an ETA. Our Ekornes Furniture Specialists will also do a “double check” to make sure you are receiving the lowest, discounted pricing available. 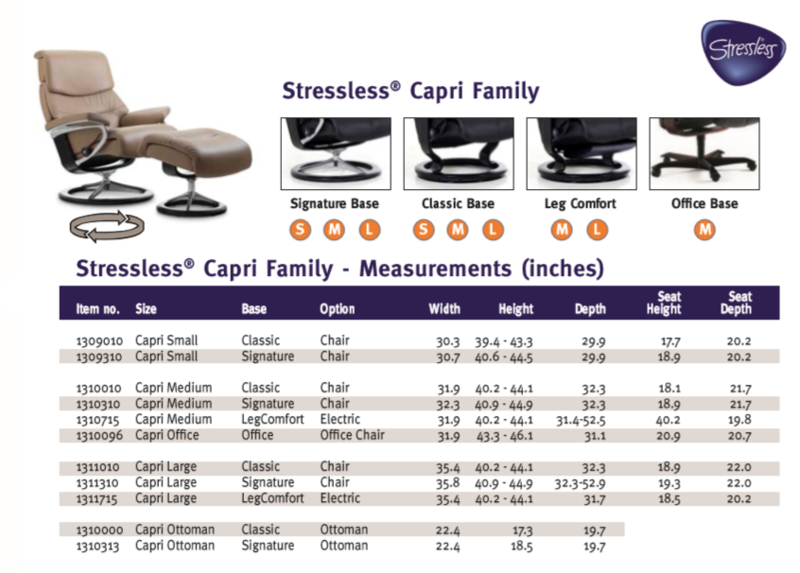 Still have questions about the Stressless Capri Office Chair or any of the other amazing Stressless products offered through our website? Call 888-486-9463 to speak with an Ekornes Furniture Specialist. They are available to answer all questions and help find the perfect Stressless Office chair for any home or office. 10 Year Warranty on Internal Mechanism- Ekornes Guarantees the internal mechanism of its recliners for a period of 10 years from the date of purchase of the product. The 10 Year Guarantee covers the Plus System and the internal metal frame, including the the metal springs and gliding system. It does not cover damage to the leather, woodwork or any faults or damage caused by the use of the product other than in accordance with the manufacturer's recommendations, as well as any faults or damage arising from any repairs made by anyone not specifically authorized by the manufacturer. 5 Year Warranty on the base- The 5 year warranty covers the base for the chair and ottoman, including the swivel ring, gas lift, extensions as well as all foam and interior padding in the chair and ottoman. Also includes electronic parts and motor for LegComfort mechanism and all accessories. Please note that some deformation and indention in padding is considered normal and is part of the break-in process. 2 Year warranty on LegComfort Battery. 1 Year warranty on leather or fabric upholstery- The 1 Year warranty covers the leather or fabric upholstery including stitching and zippered assemblies, assuming that the product has been cared and maintained using Ekornes approved guidelines for maintaining leather furniture. *This warranty only protects you when you purchase an Ekornes product from an Ekornes authorized retailer (e.g. The Unwind Company and Unwind.com). This warranty only applies when you have purchased Ekornes Furniture for your own normal indoor use. This warranty does not cover floor samples or products designated "As Is" at the time of purchase. **The Ekornes warranty covers the cost and shipping of replacement parts. Ekornes, The Unwind Company or Unwind.com LLC is not responsible for any other costs incurred while replacing the product, including but not limited to service/repair charges.